Pallas Kunaiyi-Akpanah runs the floor. The junior forward scored 12 points and grabbed 20 rebounds in Sunday’s win over Rutgers. Pallas Kunaiyi-Akpanah’s eyes followed her finger down the stat sheet in front of her, analyzing it until she found the numbers she was looking for. It took a couple seconds for her to find her stat line: 12 points, three steals and four blocks. And then she saw she had 20 rebounds. “Damn,” Kunaiyi-Akpanah said when she noticed the number. Moments later, after coach Joe McKeown looked at the same piece of paper, he praised her for the physicality and leadership that helped Northwestern (11-19, 4-12 Big Ten) through its eight-game losing streak, a host of injuries and the aftermath of junior captain Amber Jamison’s departure from the program. In the Wildcats’ 63-50 win over Rutgers (19-11, 7-9), Kunaiyi-Akpanah set the school record for rebounds in a single season with 355, though she had to check the math afterwards to be sure. Then, as she did after taking an elbow to the gut in the opening minutes and getting the very next rebound, the junior forward continued to not back down. Optimism like Kunaiyi-Akpanah’s was prevalent after NU picked up its most impressive win of the season. Freshman guard Lindsey Pulliam led the Cats with 23 points by hitting several contested pull-ups, and senior center Oceana Hamilton said her teammates see her as a future star in this conference. NU out-rebounded the Scarlet Knights by 19, and Kunaiyi-Akpanah said they’ve finally learned how to stay aggressive for forty minutes. For most of the season, the Cats haven’t had a reason to be this confident. After Jamison left NU in November and senior guard Lydia Rohde injured her foot five weeks later, NU had lost both of its captains. The Cats, with only eight healthy contributors since, lost by 27 in their Big Ten opener against Minnesota as well as 12 of their 16 conference games. Before Sunday, their only Big Ten victories came against the two teams below them in the standings, and NU lost by 34 to No. 14 Ohio State just four days ago. But coach Joe McKeown said he has seen his team mature enough to succeed in the postseason. His optimism doesn’t end there. When McKeown first put Pulliam, Kunaiyi-Akpanah, freshman guard Jordan Hamilton and sophomore forward Abi Scheid together in the preseason, he said he envisioned them playing as well as they did against Rutgers. He anticipated this defensive intensity and explosiveness as he “baptized them by fire” against the Big Ten. But, according to Her Hoops Stats, their offense and scoring defense have both been below average. Ready or not, the Cats are set to face No. 13 seed Wisconsin on Wednesday in the Big Ten tournament, and the Badgers beat NU by 12 last month in Madison. If they advance, the Cats will face No. 5 seed Iowa, who beat the Cats 70-61 in Evanston. Two seasons ago, the Cats advanced to the tournament semifinals after winning just four games in conference play, upsetting Minnesota and Indiana at Bankers Life Fieldhouse. 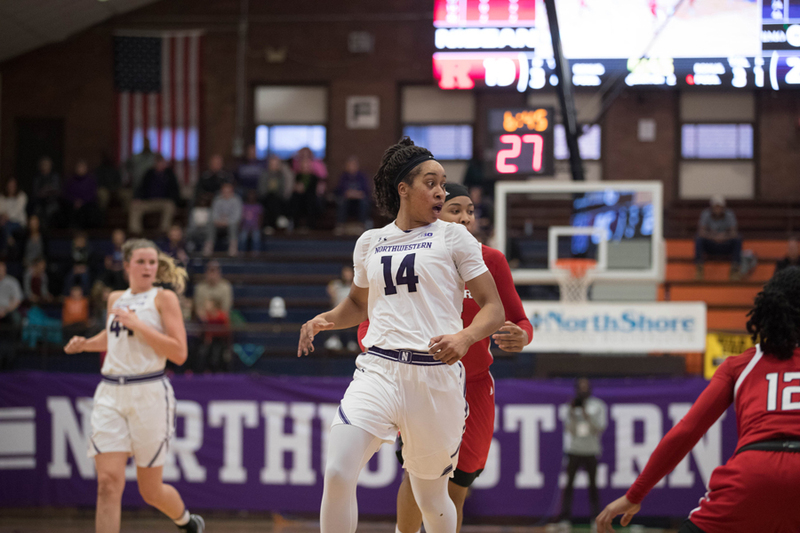 Oceana Hamilton, who was on the bench for the games against the Golden Gophers and the Hoosiers in 2016, said NU is confident enough to overcome the latest adversity the Cats have to deal with. Like Kunaiyi-Akpanah, she doesn’t back down from the challenge ahead.